Q. When I switch my presentations from 4×3 to 16×9 and back, the graphics get skewed. Is there any way to avoid this? A. This isn’t a perfect process yet. Graphics stretch out when you go from 4×3 to 16×9; and the two choices when you go back the other way, Maximize or Ensure Fit, usually leave you with more work to do. Make the shift on a copy of your presentation. Then copy and paste the graphic objects over to the new one in the correct dimensions. I often create two versions of my presentation, one in 4×3 and one in 16×9. It’s extra work, but consider that the most important people to please are your audience! Q. I see a new button in PowerPoint called Linked Notes. What is that? A. 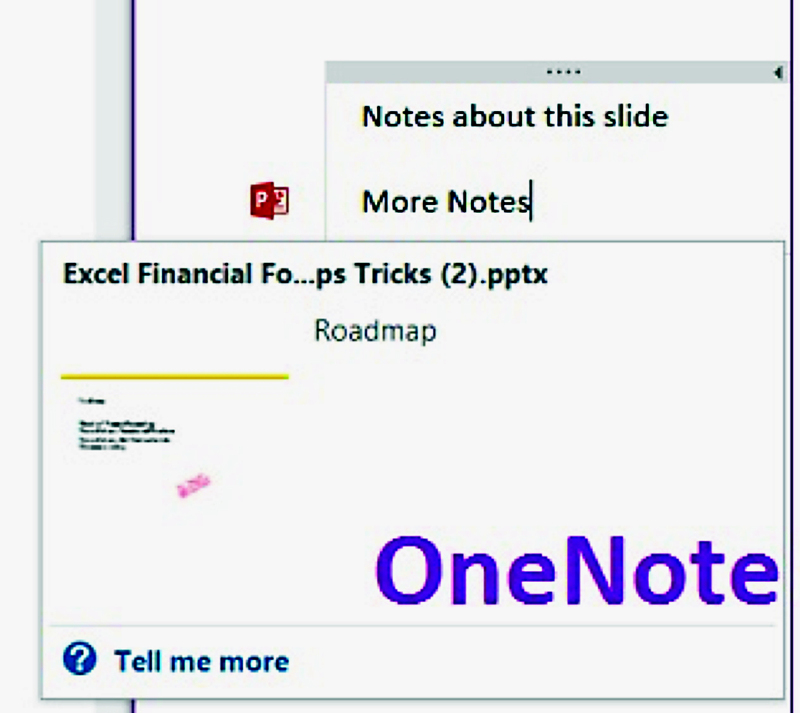 Another way that you can prepare speaker notes, or provide a click-along guide to your presentation, is to use OneNote. When you click the Linked Notes button, it creates notes that are linked to this particular slide. When you click on the PowerPoint icon that accompanies the note in OneNote, it will pop up a thumbnail of the slide you were on when you clicked it. It is best to create the notebook page first so it is easy to select when OneNote asks for the location of your presentation notes. Q. 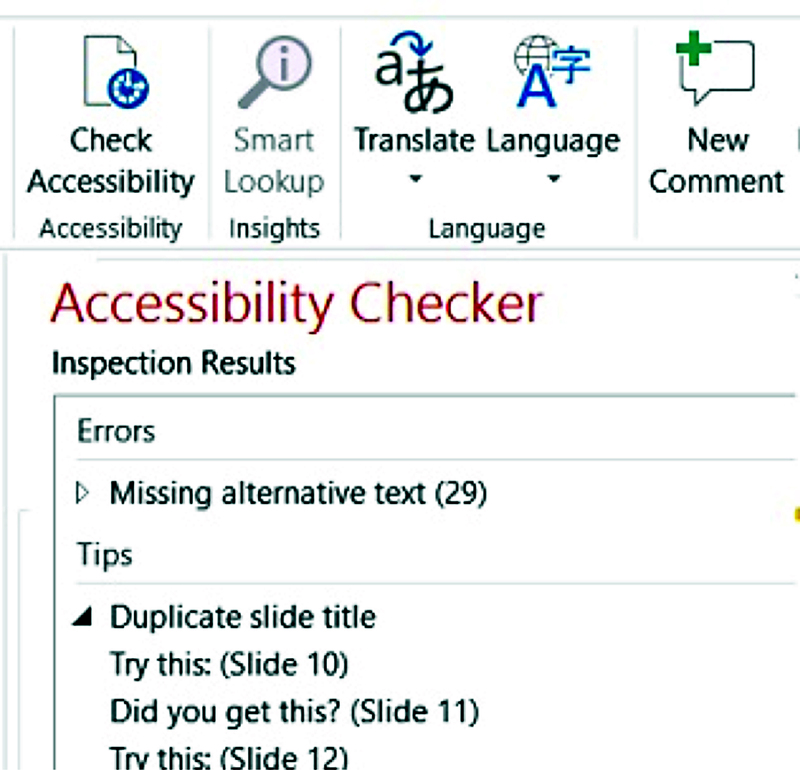 What does it mean to have a slide presentation “accessible”? A. Accessibility standards were developed to help people create presentations that can be navigated by those who may be visually handicapped. For example, all your graphics should have “alt text,” which describes the graphic when it is hovered over. For those who have accessibility features enabled, this will read them the alt text so they know what the graphic is depicting. As well, you can use the Selection pane to list objects on the slide as you intend, so the slide text is read to the viewer in the appropriate order. On the Review tab, you’ll see a Check Accessibility button, which will help you apply these standards.